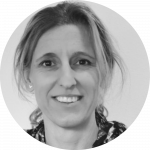 Ingrid graduated in 1995 as podiatrist at Fontys Paramedische Hogeschool. She started focussing on the treatment of athletes, and became one of the first graduated sport podiatrists. She then followed the training for manual therapist, which she successfully completed in 2015. As sportpodiatrist / manual therapist she treats both amateur sporters as top athletes. She was staff member in Vacansoleil DCM cycling team and in the premier division triatlon team ‘Vodafone/Citystarters Team TTW‘. She regularly writes for magazines such as Podosophia and in the cycling magazine ‘Fiets’ and ‘Feminin’. In addition, she provides guest lectures at the Fontys and Artevelde Sports Podiatry training in Ghent and shares her knowledge through Profysic education.